Have you ever dreamed of becoming an elite motocross racer? It's time to gun that engine for the checkered flag and make those dreams a reality. 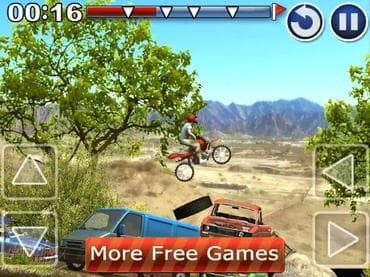 Free full version dirt bike game! No banners, no ads, no in-app purchases! Have you ever dreamed of becoming an elite motocross racer? Do you want to hear the sound of flashbulbs when you hoist the champion's trophy? It's time to gun that engine for the checkered flag and make those dreams a reality. This bike challenge is sure to get the adrenaline pumping. Detailed graphics and a rock and roll soundtrack create an authentic motocross experience. It's time to go the distance. Play this free full version dirt bike game now. If you have questions about Dirt Bike Pro game, please contact us using this form.